I think most of you do not know this gentleman, shortish guy little to no hare and my guess is that he is in his 70’s plus. He is a member of the Royal Cape Yacht Club since 1945 at that stage there was not the luxury of walk-on moorings, yachts were on swing moorings. He is still a very keen sailor and has a permanent crew position on a 52 footer. He sailed a lot with John Robertson’s father and that is where his connection with the Holiday 23 started. John Robertson was an engineer and used to work for the De Beers mining company on the West Coast of South Africa. He then started building the Charter 34 yachts and at a stage mentioned to Jerrold that the demand for big boats are dwindling and that he is considering to close shop. Jerrold asked him why he doesn’t build a yacht for the people, a boat that people really want. He got a fairly smirk answer to his question but that did not discourage Jerrold and after a week he got back to John with his idea. Ample storage for mooring lines, etc. Woodwork inside had to be teak with proper cushions for the bunks. They took their idea to yacht designer Angelo Lavranos, according to Jerrold Angelo he said that he put in more time in designing the Holiday 23 than he was use to with bigger boats. They built models and played around with it to get the best possible layout. After that was done the hard work started during ± 1983 in the garage of John’s father where John and Jerrold built the mould for the hull. The first Holiday 23 saw the light with a slightly shorter keel than we are use to, but was lengthened after sail trails. Only the original mould were used during the whole production period. The first boat sailed well, but there was a problem. Nobody knew about this lovely little boat and there were no money. Jerrold offered to buy the first six yachts, they put an add in a sailing magazine and had 3 enquires from prospective buyers in the old Transvaal. John’s mother stayed in a suburb of Johannesburg called Orange. John and Jerrold towed the Holiday 23 to Transvaal and in the street in front of the house they put up the mast and sails for the three prospective buyers to come and have a look. The first two Holidays were sold and many followed shortly, with Jerrold and his wife delivering Holiday 23’s all over the country, from Vaaldam, Spioenkop dam, Ebenezer, Kariba, Midmar, Theewaters, etc. Within the first two years of production over 40 boats were built and sold! When production stopped in ± 1991, 189 Holiday23’s were built and sold. Apart from that the factory also built and sold 80 Holiday 34 and L34’s. Jerrold estimates that approximately 90% of Holiday 23 buyers then had no or very little sailing experience. Many of them sold their Holiday 23’s afterwards and upgraded to the H34 or L34. 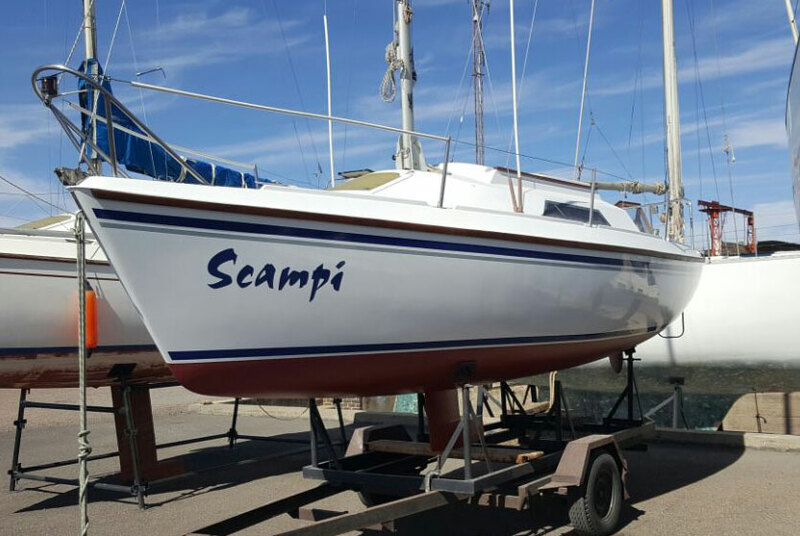 John Robertson had various experiences in repairing other yachts that had osmosis and used that knowledge for the construction of the Holiday 23. So far no Holiday 23 had any signs of osmosis. Jerrold says that he frequently visits Australia and the UK and always keep an eye open to see if he can see any yacht there which compares with the Holiday 23, but had so far not seen even one. In my view something miraculously happened during the early eighties, “cometh the hour cometh the man” someone once said. When all looked glim Jerrold got the inspiration, saw something no one else saw and the result was exceptional. Many sailors, including me, were and are still having the opportunity to own and sail at an affordable price. Many jobs were created during the production period putting food on peoples table through the vision of this man. They had competition from the Stadt 23 which was also built during that time, but even at the price of an average family car costing more than the Stadt 23 it was never in contention. In 1988 the first Holiday 23 Vaaldam Masters were held on the Vaaldam with ± 19 Holiday 23’s attending. Jerrold Salamon we salute you and others who were involved in building the Holiday 23, many people can tell stories about their experience being an owner of a Holiday 23 and what it ment for them personally and their families. Greetings from the land of the long white cloud, and thank you for thinking of me. I hope I am not being presumptious with the use of first names, but here in NZ we are very informal and never write anything in capitals. Congratulations on your entertaining and informative website. It gives me great pleasure to see that the class is alive and well ! I once was at the Fun Worlds and did a race or two. The sailing venue outside Laaiplek is just terrific, as is the river, and I'm sure everyone generates a real party atmosphere at the Port Owen club there.